On the morning of her wedding day, Clare has a chance encounter with an old woman who gives her some very good advice. After her wedding, Clare is notified that the old woman she spoke to for just a short time has left her a house. Intrigued by the mystery, Clare visits this house and immediately falls in love with it. What follows is a fantastic story of mystery and discovery as Clare sets out to discover who this woman really was and what connection they really shared. Normally we would only feature one title for our blog, but we couldn't pick just one book for this week! YYCPride runs August 24th through September 3rd, and we wanted to help celebrate by bringing you some fantastic titles that are written by and/or about LGBTQ+ people. Mean by Myriam Gurba: "True crime, memoir and ghost story, Mean is the bold and hilarious tale of Myriam Gurba's coming of age as a queer, mixed-race Chicana." Tomboy Survival Guide by Ivan Coyote: "Tomboy Survival Guide is a funny and moving memoir told in stories, about how they learned to embrace their tomboy past while carving out a space for those of us who don't fit neatly into boxes or identities or labels." Disoriental by Negar Djavadi: "In this high-spirited, multigenerational tale, key moments of Iranian history punctuate a story about motherhood, family, exile, rebellion, and love. 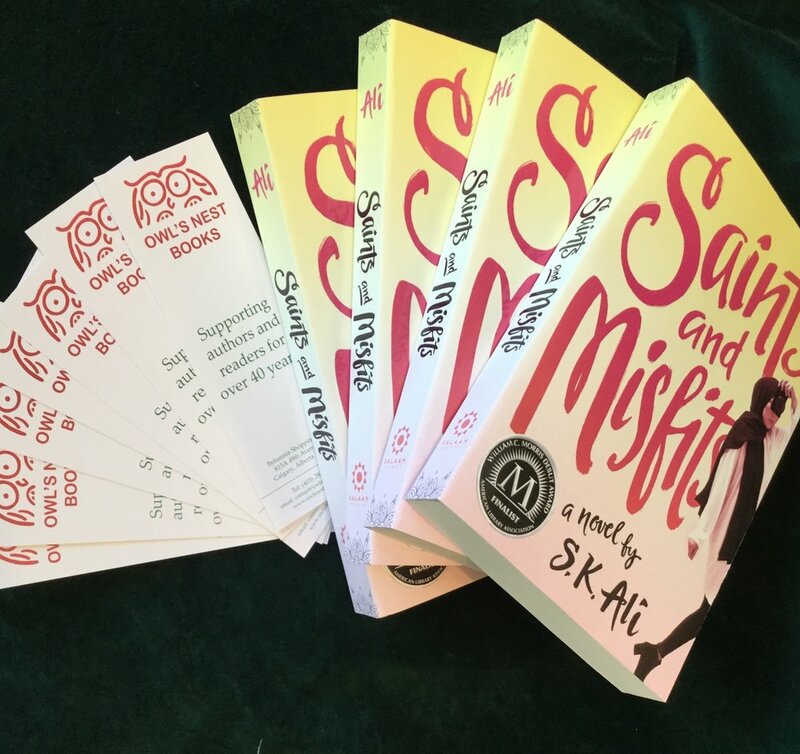 At the heart of this prize-winning international bestseller is the unforgettable Kimia Sadr - queer punk-rock aficionado and storyteller extraordinaire, a woman caught between the vibrant intricacies of her origins and the modern life she's made." Symptoms of Being Human by Jeff Garvin: "Riley Cavanaugh is many things: Punk rock. Snarky. Rebellious. And gender fluid. Some days Riley identifies as a boy, and others as a girl. By Riley isn't exactly out yet. And between starting a new school and having a congressman father running for reelection, the pressure - media and otherwise - is building up in Riley's so-called 'normal' life." The Clothesline Swing by Ahmad Danny Ramadan: "The Clothesline Swing tells the epic story of two lovers anchored to the memory of a dying Syria. Hakawati, a storyteller, relays remembered fables to keep life going for his dying partner. Each night he waves stories of his childhood home in Damascus, of the cruelty he has endured for his sexuality, of leaving home, of war, of his fated meeting with his lover. Death himself joins the conversations, eavesdropping on the two men's secrets as he awaits their final undoing." This Is How It Always Is by Laurie Frankel: "This is Claude. He's five years old, the youngest of five brothers, and loves peanut butter sandwiches. He also loves wearing a dress and dreams of being a princess. When he grows up, Claude wants to be a girl. Rosie and Penn want Claude to be whoever Claude wants to be. They're just not sure they're ready to share that with the world. Soon the entire family is keeping Claude's secret. Until one day it explodes." 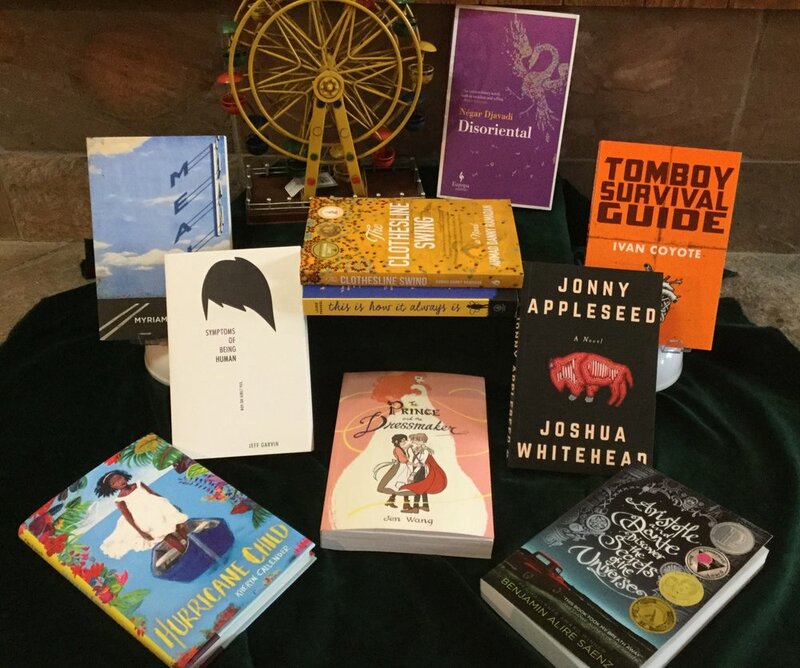 Jonny Appleseed by Joshua Whitehead: "'You're gonna need a rock and a whole lotta medicine' is a mantra that Jonny Appleseed, a young, Two-Spirit/Indigiqueer and NDN glitter princess, repeats to himself in this vivid and utterly compelling debut novel by Joshua Whitehead." Aristotle and Dante Discover the Secrets of the Universe by Benjamin Alire Saenz: "Dante can swim. Ari can't. Dante is articulate and self-assured. Ari has a hard time with words and suffers from self-doubt. Dante gets lost in poetry and art. Ari gets lost in thoughts of his older brother who is in prison....Against all odds, when Ari and Dante meet, the develop a special bond that will teach them the most important truths of the lives, and help define the people they want to be." Hurricane Child by Kheryn Callender: "Being born during a hurricane is unlucky, and twelve-year-old Caroline has had her share of bad luck lately...But when a new student named Kalinda arrives, Caroline's luck begins to turn around. Kalinda...becomes Caroline's first and only friend - and the person for whom Caroline has begun to develop a crush. Now Caroline must find the strength to confront her feelings for Kalinda, brave the spirit stalking her through the islands, and face the reason her mother abandoned her." The Prince and the Dressmaker by Jen Wang: "Prince Sebastian is looking for a bride - or rather, his parents are looking for one for him. Sebastian is too busy hiding his secret life from everyone. At night he puts on daring dresses and takes Paris by storm as the fabulous Lady Crystallia - the hottest fashion icon in the world capital of fashion! Jen Wang weaves an exuberantly romantic tale of identity, young love, art and family. A fairy tale for any age." Winner of the Hilary Weston Prize for Non-Fiction. On first examination, this book is a medical memoir by an emergency room physician about his work at St. Michael's Hospital in Toronto, as well as the Black Lion Hospital in Addis Ababa. Despite the obvoous differences in resources that are available to him and his colleagues at each location, what draws us into his high-adrenaline world are the needs and humanity of the people who come, or are brought, to the emergency room to be mended, have their suffering eased, and live longer. Using a chapter for each letter of the alphabet to structure his memoir (A for Airway, B for Breathing) Maskalyk begins and ends with his grandfather who lives in Northern Alberta. On the whole, a very personal story of idealism and passion, and so incredibly well written. Currently this title is available in hardcover, which can be reserved here. The paperback is due out August 28th, and can be reserved in advance here. A teen novel involving Tolstoy? Sign me up! Natasha ("Tash") and her friends have been making an amateur web adaptation of her favourite novel, Anna Karenina, which they've called "Unhappy Families". When a famous vlogger gives them a shout out, their popularity explodes. Tash suddenly must deal with both fans and haters as she and her colleagues try to finish filming the last episodes, despite one of the key actors quitting. At the same time, Tash begins to correspond with another vlogger, Thom. When "Unhappy Families" is nominated for an award, Tash might finally get to meet him IRL. The only hitch is Thom's been getting flirty over texts and Tash is asexual. A fun teen romance that gently explores sexual orientation and gender identities, Tash Hearts Tolstoy also contains questions for readers about the price of fame and the danger of thinking our heroes are perfect. Reserve your copy of Tash Hearts Tolstoy here. It is Penelope Rex’s first day of school and imagine her excitement when she finds her class is full of human children, and children are so delicious! However, Penelope finds it is very hard to make friends when you keep eating them. Luckily, her teacher is on top of things, so no one gets hurt, however it takes the classroom goldfish to truly get the message across to this silly little dinosaur. We Don’t Eat Our Classmates is my favourite new book – of any genre. The illustrations are perfect, with the children looking like cute, little humans, and Penelope herself being an adorably drawn, giant-headed, little T-Rex in pink overalls. The expressions on the faces of the characters draw you right in; making you feel what they are feeling. Both boys and girls will enjoy this book, and truly, anyone of any age will have fun reading it and seeing the giggles it brings about. The message of this book is hidden in humour and is one children will remember, and will have enjoyed learning. Reserve your copy of We Don't Eat Our Classmates here. When this new edition of The Anne of Green Gables Cookbook was released, I felt a blast from the past. Originally published in 1985, this was the first cookbook that was "mine". I have many wonderful memories of making these recipes with my mom, including one where we turned the kitchen into a disaster area with our first attempt at Marilla's Plum Pudding (the recipe is sans mouse). This new 2017 edition includes many new recipes, including some from L.M. Montgomery's kitchen. This is a great gift of Anne fans of any age. Reserve your copy of The Anne of Green Gables Cookbook here. Also check out Marilla of Green Gables by Sarah McCoy, coming in Fall 2018 from HarperCollins. The dish towel pictured was purchased at Finishing Touches, just one block down Elbow Drive. It’s easy to see why this book was a finalist for the William C Morris award, and why it was long listed for Canada Reads. It is an amazing story that is perfect for all ages, all religions, all races. It is a story of finding your voice, of monsters hiding behind masks. It is a story that is relevant to every person, every where, right now. This western takes place in the 1880’s on the untamed Australian frontier. It is a very unforgiving place, full of savagery, racism, and injustice, with a harsh landscape and even harder people. A thirst for vengeance is the main action surrounding this novel, as two brothers are faced with the brutal deaths of their family. They turn for help to the wealthiest landowner in the region, a man whom their father disliked, and find themselves caught up in more than they bargained for. The journey will forever impact the youngest brother, as he tries to discover what kind of man he wants to become. Imagine a world where there are two kinds of people -- those with magic and those without. Now, imagine that those "without" must submit themselves to ten years of slavery to those "with". That is the world created by author Vic James in the thrilling Dark Gifts series. But just because that's the way the world is, doesn't mean that's the way it needs to stay. The first two book, Gilded Cage and Tarnished City, are available now. The third, Bright Ruin, will be available in Canada on October 9, 2018. Come by the store to pick up and preorder your copies today and you can chat with Kristi abut other science fiction and fantasy titles with amazing world building. Staff Pick: Judith's excited about the official "The Hate U Give" trailer! The countdown has started for the release of the film version of The Hate U Give, based on the fantastic novel by Angie Thomas. Check out the trailer now, and come on down to the Nest to hear Judith yammer on about the book! "Three incidents in three disparate regions of France. On the surface, there is no connection, but the three individuals involved do have one thing in common. They all sit on a committee that chooses book titles for The Good Novel, a bookstore in Paris, which prides itself on only selling ‘good’ novels. An intricately drawn mystery providing a unique look into the behind-the-scenes workings of a bookstore." Nour, twelve years old and struggling to understand how to make life go on after the death of her father, has just moved to Syria from New York with her mother and sisters. But the Syria of her mother’s youth is changing and all too soon the war and unrest reaches their quiet home in Homs. Losing everything they owned in the bombing, Nour and her family begin the long journey of refugees, seeking safety somewhere away from the fighting. Holding on to the stories her father had told her, Nour must face her fears and find her voice again, discovering what is truly important in life. In a small corner of Yorkshire, England, an unconventional man sets out to rebuild a life for himself and his two children in the hamlet of Elmet. Fiona Mozley’s first novel was shortlisted for the 2017 Man Booker Prize. It is a gripping exploration of family bonds, loyalty, and the will to resist power that seeks to corrupt and destroy everything in its wake. Senior Owlets will be discussion Exo by Fonda Lee for our final meeting of the 2017-2018 year! Here are Kristi's thoughts on this selection, which were originally posted on her personal Tumblr on 29 May 2018. So excited I can celebrate Fonda Lee’s newest book! Out today, Cross Fire continues the story of Donovan and his fellow stripes from Exo. I loved Exo so much when I read it last year that I chose it to be the June selection for Owl’s Nest Books Senior Owlets book club (with the meeting taking place on June 2nd). If you enjoy science fiction this is a fantastic read - the world building is amazing and the story makes sense (I’ve read some sci fi that leans far to hard on the fiction portion and forgets the science part). Check back for our 2018-2019 reading list! Contact us at 403-287-9557 or contact@owlsnestbooks.com to register.